I love Pilau rice. I always order it when we get an Indian takeaway or supermarket ready-made curry (yes I do like a break from cooking, occasionally!) But for years I always thought it must be very complicated to make at home, so never bothered. I would either do plain basmati rice with my curries or I would buy the ready made stuff from the supermarket (my children absolutely love ‘yellow rice’ as they call it). Well, when I was working on my Lamb Rogan Josh recipe, I decided I would have a bash at making my own pilau rice and do you know what I discovered? It’s really easy peasy to make at home, even more delicious than the shop bought stuff…and, even better, my kids love Mummy’s homemade pilau rice too (phew!). To develop my perfect pilau rice recipe I scoured the internet for inspiration…and do you know what? There are about a million interpretations of pilau rice! 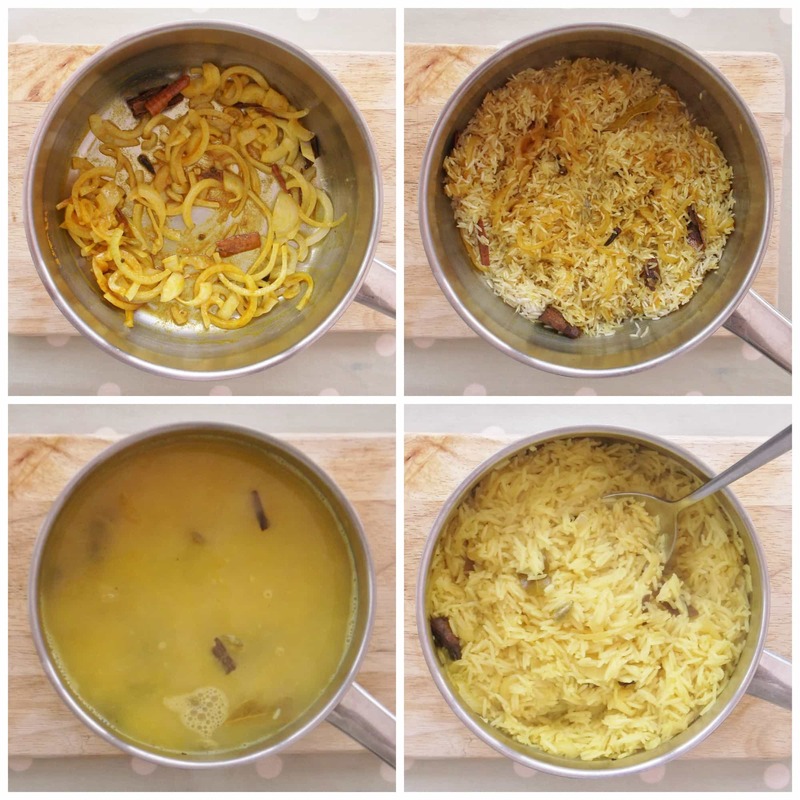 So I set about picking and choosing the elements I really like and focusing on spices that I actually have in the cupboard and I’m really pleased with the result…it definitely tastes like pilau rice…delicate and aromatic, and it tastes so great with all my curries. It’s the perfect partner to my Lamb Rogan Josh, which I shared with you on Tuesday, but it would also go fantastically with my Leftover Roast Beef Curry, my Easy Chicken Jalfrezi or my Easy Chicken Korma. Melt the butter very gently in a medium-sized saucepan. Add the sliced onion, cinnamon, bashed cardamom pods, cloves, turmeric, salt and bay leaves. Cover with a lid and cook on a low heat for 5-10 minutes until the onions are very soft but not brown, stirring occasionally. Add in the basmati rice and stir to coat the rice in the onions and spices. Pour in 600ml boiling water and bring back to the boil. Cover with a lid and turn the heat right down. Continue cooking for 8 minutes or until all the water is absorbed. Turn the heat off completely (take the saucepan off the burner if you are using electric), but leave the lid on. Allow the rice to steam for 5 minutes. Serve with your favourite curry or why not try this with my Lamb Rogan Josh? I am sharing this recipe with Brilliant Blog Posts, Cook Blog Share and Recipe of the Week. Wow! Is it really that easy to make? Bookmarked! I too have only ever tried pilau rice when I’ve eaten out, it’s never crossed my mind to make our own. Now I realise it’s straight forward to do, it certainly packs more flavour then plain old boiled rice. I made this dish yesterday to go with your Chicken Rogan Josh. Both were absolutely delicious, especially together. My family can’t wait for lunch when we can finish the leftovers!